Previous research indicates that infant vocalizations are effective predictors of later articulation and language abilities (Locke, 1989, Menyuk, Liebergott, Shultz, Chesnick & Ferrier, 1991, Oller & Seibert 1988, Jensen, Boggild-Andersen, Schmidt, Ankerhus, Hansen, 1988). Intervention to encourage babbling activity in at-risk infants is frequently undertaken. Research and clinical diagnosis of delayed or reduced babbling have so far relied on time-consuming and unreliable perceptual analyses of recorded infant sounds. 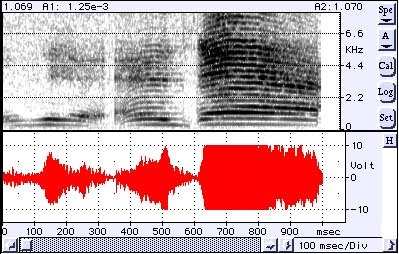 While acoustic analysis of infant sounds has provided important information on the early characteristics of infant vocalizations (Bauer, 1988, Stark 1986) this information has still to be used to carry out automatic, real-time analysis. We are developing a program, EVA, for the Macintosh computer that automatically analyzes digitized recordings of infant vocalizations. In validity-testing of the first stage of development, our human judge and EVA had 92.8% agreement on the number of utterances in the 20 minutes of recordings, commonly identifying 411 utterances. Their categorizations agreed 79.8% for duration and 87.3% for frequency, better than human inter-judge agreement reported in the literature. The authors hope that the final version of EVA will serve as a reliable standard for the analysis and evaluation of utterances of typical and at-risk infants with a variety of etiologies. The acoustic information gained from such analysis will allow us to develop a computer-based system to encourage early vocalization. Susan G. Worst, M.A., M.S. Partial support for this work was provided by National Institutes for Health grants: #R41-HD34686 and #R42-HD34686. Find out about our Baby Babble Blanket (BBB). Last Updated: December 21 2005, 8:36 p.m.